ROCHESTER, N.Y.--(BUSINESS WIRE)--Exelis (NYSE: XLS) has successfully flight tested a long-wave infrared (LWIR) hyperspectral (HSI) sensor capable of pointing in multiple directions to identify threatening substances and gases. The integrated sensor and processing system provides real-time information about the composition of gases and solids, which is critical in the detection of improvised explosive devices or leaks emanating from containers and pipeline used in a variety of industries from oil and gas to chemical manufacturing and nuclear power, among others. LWIR sensors must be cooled using a cryocooler to temperatures significantly below zero degrees Fahrenheit. At these temperatures the sensor is sensitive enough to detect and identify small amounts of gas released into the atmosphere as well as solid materials on the ground. 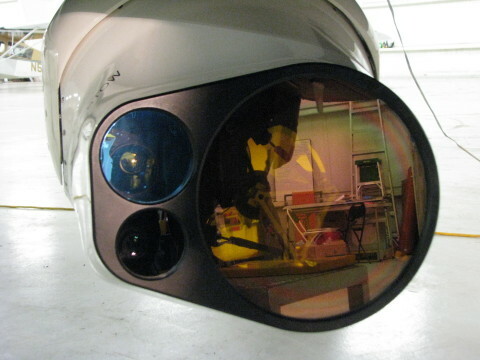 Most HSI sensors are mounted to aircraft such that the platform is required to fly directly over a target to collect imagery. With a system housed in a gimbal that can be pointed in multiple directions, the sensor can collect larger areas of imagery pointing both directly down to the ground and across the horizon. Also, with an on-board processing capability under development by Exelis, the system is suitable for mid-size to large manned and unmanned systems and provides a material identification system unavailable elsewhere to enable the fast collection of data without users being put into harm’s way. For the flight test, the Exelis team staged various substances and materials around the Rochester area to test the sensor’s collection capabilities. After successful collection, the data were recorded and stored for processing later to ensure the materials could be properly identified. During a regular flight operation, the material would be processed immediately on board the aircraft, speeding up the time for the information to be used by customers. More flights are planned in Rochester for additional testing. Exelis has successfully flight tested a long-wave infrared (LWIR) hyperspectral (HSI) sensor capable of pointing in multiple directions to identify threatening substances and gases.